Direct Rail Services has ordered a further seven Class 68s, taking the fleet size (eventually) to 32. Currently 15 are in the UK, with deliveries of the next ten to start in the autumn. Vossloh Espana will build the locomotives at its Valencia factory in Spain. The mixed traffic locomotives are from the company’s Eurolight platform, but because they have been adapted for the UK gauge and British regulations, Vossloh has branded them the UKLight. The ‘68s’ are owned by Beacon Rail Leasing Limited, which then leases them to DRS. The question: Has there been a relaxing of the emissions laws for diesel rail vehicles? Alternatively this Class 68 order is possible because it is a top-up of an order for which delivery is still in progress. 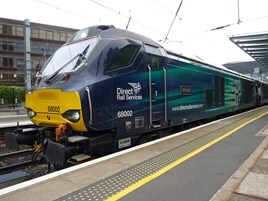 A year ago there was the prospect of no more new diesel locomotives (besides electro-diesels with a fraction of the power available in diesel mode) being available after 2015 began, due to the impediments in fitting exhaust treatment systems within the restrictive British loading gauge without compromising the power-to-weight ratio. If further Class 68s are indeed permissible, they could be used to speed up many longer-distance services on non-electrified routes. The Class 156 DMUs have their [single leaf] doors at the end of each carriage - a barrier to cutting platform dwell times on interurban routes with closely spaced stations. But maximum speed is 75mph. There will be a diminishing number of routes that can cope with both long dwell times and a low 75mph maximum speed. The Class 156s could have yaw dampers fitted and their Cummins 285hp engines removed (to become spares for Class 150s), to be hauled by Class 68s at up to 100mph. (whether the BSI couplers would physically cope with locomotive haulage is another matter - the answer is probably no) Their former duties would be covered using diesel-electric multiple units (with double leaf doors) capable of having their engine and generator sets (similar to those used for the Vivarail D-Train) swapped for transformers and batteries during conversion into purely electric trains. @Ben H, I believe the regulation applied to the prime mover engines (from Caterpillar in this case) and not the actual locomotives. So provided the engines were available at the end of 2014 the locomotives could still be built to take the available engines. The same applied in the case of the last few 66s, at least one of which used an engine from another withdrawn locomotive.